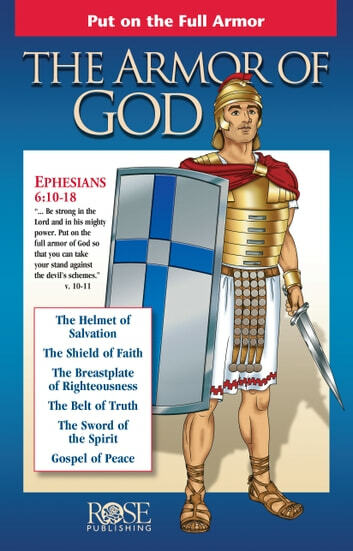 The Armor of God - Learn to "stand firm in the faith." This Christian ebook helps to bring Apostle Paul's message to the Ephesians (6:10-18) to life. 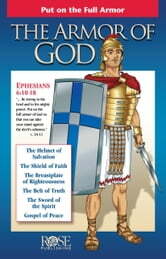 This bestselling ebook provides a historically accurate background of a Roman Centurion's armor then draws vital correlations to the spiritual armor God gives his children: the Belt of Truth, the Breastplate of Righteousness, Feet Prepared with the Gospel of Peace, The Shield of Faith, The Helmet of Salvation, and the Sword of the Spirit. Glossy, full-color ebook will help you to ""stand firm in the faith."" Learn to put on the full armor of God when facing temptations and struggles. The key to this best-selling Christian ebook is the insights brought by Paul's knowledge of a Centurion's armor. Having a correct picture in mind is important to accurately teaching and understanding this portion of Scripture. While many other illustrations of The Armor of God show armor from the Middle Ages, or other time periods, the Rose illustration presents historically accurate Roman armor. In a side-by-side fold-out format, The Armor of God ebook describes each piece of armor, its historical background, and its application to our spiritual battles today. The Apostle Paul knew how important it was for believers to understand the provision of spiritual armor that God made for them. Paul's teaching to the Church at Ephesus was born out of firsthand knowledge of Roman Centurions' armor. He saw them up close on many occasions. •Dr. Charles F. Stanley, When the Enemy Strikes: The keys to Winning Your Spiritual Battles. Full of important information we as Christians need to be aware of & exercise daily!! I will hold this dear to my heart!